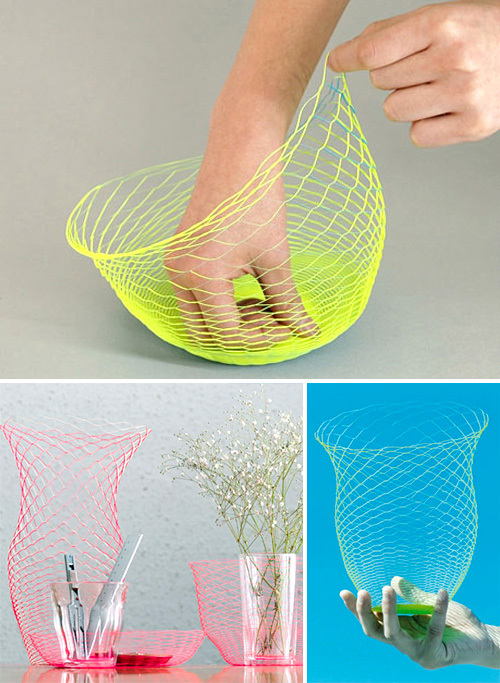 Air Vase Grows From A Single Piece Of Intricately Cut Paper | OhGizmo! They aren’t going to hold a drop of water, so referring to these decorative bowls as ‘vases’ is a bit of a misnomer. But as an eco-friendly way to decorate your home, they’re certainly unique. Each Air Vase starts as a single circle of intricately cut paper (we’re assuming lasers are involved) that can be stretched out to a various shapes and containers with some careful manipulation. And from what we can tell, the Air Vases are probably made from a thicker card stock, given how well they hold their shape. Each side is also printed with a different color or design, so the completed vases will look different depending on what angle you’re looking at them from. There’s an official Air Vase book (~$27) available which seems to do nothing more than illustrate the various ways you can use Air Vases. But a set of 3, in white, is available from Kaminokousakujo.jp for ~$16. it is not lasers but “molded cut”.